As we approach the end of the first decade of the 2000's there are bound to be a great many reviews of what we have experienced in the past ten years and what has defined the new century. 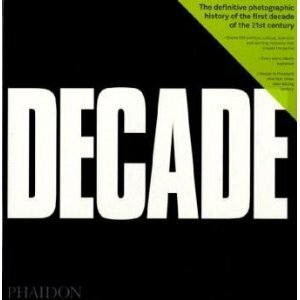 One of the most interesting instances of this to already come to light is a new book, published by Phaidon and complied by Eamonn McCabe, called Decade . The book contains around 500 images over, 512 pages, and covers all of the expected events - 9/11, the war in Afghanistan, climate change, global economic crisis and the proliferation of social media as a dominant social force. Aside from these subjects, however, the book also turns to less expected territory such as the state of the art market over the past 10 years. A legendary auction house figure and source of knowledge on the art market, Christopher Burge, contributes and essay titled "How the Art Market Survived," in which he reportedly describes the swelling and bursting of the art market bubble. An article by ARTINFO describes the book as cleverly using images representing the heights of the art market with the fatalities of the world wide financial collapse. An example given is the juxtaposition of an image of the Lehman Brothers meltdown, opposite a picture of a Jeff Koons Ballon Dog installed at Versailles. Other artists and artworks to make it into the book are Richard Serra's Torqued Spiral, the Berlin holocaust memorial, Martin Creed's Work. 227: The Lights Going On and Off at Tate Britain and Olafur Eliasson's Weather Project at Tate Modern. Whether you're interested on Burge's take on the whole art market or whether you just want to find out what other events and happenings made it into Decade, the books seems like it is well worth it's cost, and definitely something to keep your coffee table company this winter.